Sammer Wins the Great Greg Heffley Giveaway! Yes, indeed, our very good friend Sammer wins the chance to pick out a prize from our ultra-cool and ultra-rocking prize box. He gave us the best reason why he likes the Diary of a Wimpy Kid books. (check out what he said here and here) OK, maybe he changed his mind a bit but that's just the sign of an open mind. Come on over to the Myers Park library and claim your prize, Sammer, and congratulations! Michael K., Bob, Jennifer, and Major Fluffy are nearing their 3.14 million and 1 SHPDZ brainwave. But Agent Umber is closing in, and ther's suspicious things going on. AAA Agent Hot Megenta knows she can find the aliens in a heartbeat, but the chief won't let her and won't tell her why. Plus, Michael K.'s earth friends TJ and Venus are coming closer to knowing the secret of Bob and Jennifer. Also, Dad K. and Mom K. are mixed up in a secret conspiracy, but what they don't know is that they're actually working against each other! How will this whole situation end up? Find out in these two great books. They are some of Jon Scieska's greatest writings. Don't miss out on these! This is a collection of ten short thriller stories by top best-selling writers. If you like book series like SPHDZ, The 39 Clues, Lunch Lady, The Missing, The Shadow Children, Daniel X, or anything like these, then this book is for you! These thrillers were written specifically for guys, because Jon Scieszka only picked authors that know what guys like to read. I was surprised to see a new story written by Walter Dean Myers. That guy's been a famous writer for as long as I can remember. Unfortunately, I found only one story to be amusing and age-apropriate. That would be "The Double Eagle Has Landed" by Anthony Horowitz. It's the newest Diamond Brothers mystery. It was intruiging, funny, and it made my heart skip a beat. Everything else was not so great. I was shocked to see that even James Patterson failed to please. Horowitz put together a great tale, and I might just lok in to his Diamond Brothers Mystery series. Anyway, that's the only one worth reading in my opinion. The first book in this series was much better, Funny Business. Thanks, Michael! We can always count on you to give it to us straight. And now I want to find out more about the SPHDZ. Don't you, guys? It's Halloween in Happy Glades, and Stone Rabbit leaves his house covered in dust! He's too lazy to clean up once in a while. But he soon learns his lesson. Judy the duck has given Stone Rabbit a lamp that's powered by radioactive material. Well, what do you know, the lamp falls on Stone Rabbit's floor, which is covered in dust. The chemical reaction produces giant dust bunnies intent on eating everyone they see! Will Happy Glades ever be safe from these monsters? Read this hilarious comic book to find out! Chase, Rashawn, Nicole, and Momma Rossi are safe in the Rossis barn during Hurricane Emily... or are they? The storm is throwing objects at the barn, and the lions and leapord from the Rossi Brother's Circus have broken out of their cages! Plus, the barn has light, but the generator is quickly running out of fuel. The only way to get more gas is to go to another building uphill, through the storm and wild animals. Will Chase do it? Is anyone safe from Emily? And will Hector the leapord and Simba the lion get a four-course dinner? Find out in this awesome book! Look for book 3, Eruption, plus Roland Smith will be writing a book in the Cahills Vs. Vespers series soon! Gerdie Baker is trying to make a teleportation device. But when Heathcliff Hodges sends her the answer for her machine, it doesn't turn out to be teleportation at all. It's actually an interdimensional portal opener. Now, under the control of Heathcliff, Gerdie is taking over the multiverse! Who is Gerdie? What's Heathcliff up to? And will the NERDS actually help Heathcliff? It's all revealed in this amazingly written new book! Wow, I didn't even know there was a N.E.R.D.S. book 3 until you told us! This is really good news. These books are awesome, guys--spies, comedy and action! And I've never read any of the Stone Rabbit graphic novels, although we have them in the library system. And Roland Smith is an author that I don't know about. He must be pretty good if he's going to write a Cahills vs. Vespers book. So here you go, everyone--guy books recommended by a reader guy like you! Be sure to find them and check them out! Nick and Tim Diamond are back in three short mystery stories! Find out who's responsible for a man being crushed under a steamroller. For that matter, see if you can find out who actually died in The Blurred Man. When Tim and Nick win a vacation to Paris, strange things start happening. See if they can bust the criminals and find out what the criminals are doing in The French Confection. Lastly, Tim's old class reunion takes a deadly turn. Who's responsible for seven murders, and worse, can Tim and Nick get off the island they're trapped on? Find out in I Know What You Did Last Wednesday. Although I don't care for some of the language, I found all three stories to be mysterious, thrilling, and hilariously funny. When it comes to mysteries, it doesn't get any better than this! And check out the first Diamond Brothers book: The Falcon's Malteser. Mrs. Lilly visits Ella Mentry School. She's a newspaper reporter, and she wants to help the kids make a school paper called The Ella Mentry Sentry. A.J. thinks she's awesome! She twists story lines hugely out of proportion. For example, Mr. Macky was seen kissing his wife, Ms. Daisy. So Mrs. Lilly wrote: Mr. Macky Kisses Married Woman! A.J. is loving everything about her, and, best of all, Mrs. Lilly hates Andrea! Could things get any better? What will happen to the paper? Will Mrs. Lilly manage to get it all over the world? Does Mr. Klutz really wear underwear? And, will Mrs. Lilly get away with printing untrue garbage? Find out in this awesome book! Dan Gutman's getting better with each book he writes! Don't miss out on reading this book! Thanks again, Michael! A lot of guys like the My Weird School series, so it's good to hear that the school gets even weirder. Speaking of mysteries, I'd really like to know if you've read any of the Brixton Brothers books and what you thought of them. I'm reading the third one and really enjoying it. The Iron Guy has just finished a truly terrific book. It's Goliath by Scott Westerfeld and it's the third book in the Leviathan triolgy. I've been a HUGE fan since the first one, Leviathan , came out in 2009. (see my review here) Then came Behemoth last year (see that review here) and that left me waiting impatiently for this third installment. And, boy, was it ever worth waiting for!! All the thrills, excitement, action, battles are here as well as the incredible machinery and strange fabricated animals you saw in the other two books. In case you're new to the series, here's the background--It's 1914 and the European powers are on the brink of war. Sounds like our own history, right? Well, this is an alternate history and the world is divided into Clankers, those who use walking war machines, and the Darwinists, those who manipulate DNA to fabricate animals. When Prince Aleksandar Ferdinand's parents are assassinated, the world plunges into war and he runs into the mountains to hide form those who don't want him on the throne. In the meantime, a Scottish girl named Deryn Sharp dresses like a boy to join the British Royal Air Service. An unlikely series of events throws them together and the first two books recount their adventures. As Goliath opens, they are headed across Siberia en route to Japan when they get an urgent message from the Czar. They are to rescue Nikola Tesla, a brilliant and possibly mad scientist. Tesla claims to have invented a weapon (called Goliath) that can destroy whole cities. Prtince Aleksandar becomes obsessed with getting Tesla safely to New York, believing that the threat of such a weapon could stop the war. Deryn isn't so sure, though, but she has enough troubles of her own, trying not to let anyone know she's a girl. Does Tesla ever make it to New York? Will the great European powers just sit idly and let Tesla test his Goliath? Or will they do what they have to in order to stop him? And what will happen if people learn about Deryn's secret? And just what will Alek do if Tesla actually starts up his weapon of hugely-massive destruction? This is just a brief description of what happens in this terrific book. Along the way, there's a battle off the coast of China, hungry giant Russian war bears, an attempt by Alek and Deryn to run a radio antenna on top of the Leviathan in the middle of storm at sea, and an intense ending that will have you gripping the book so tightly that you knuckles will turn white! Not only is there action and adventure, you also get to meet real people from history, like Pancho Villa and William Randolph Hearst. You science freaks will also get all the stuff about "aeronautics," that is, flying aloft in an enormous flying fabricated beast. So this book has something for everyone!! 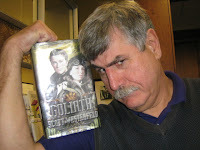 Goliath receives the Iron Guy Seal as One Terrific Book! So, achtung!! Get up and get it macht snell!! Don't waste any barking time!! Attention all you Leviathan fans!! 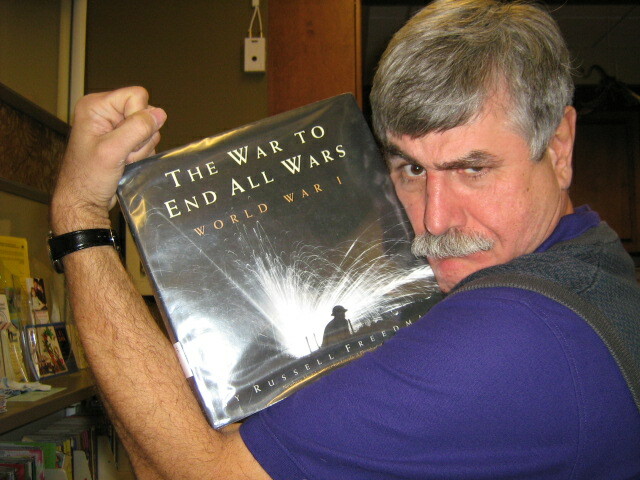 Here's a book about the REAL World War I--and it's a truly great read! 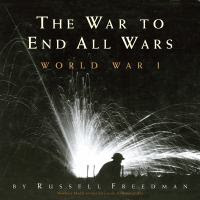 It's The War to End All Wars by the very talented Russel Freedman. Don't know much about WWI? Well, you'll find out here and, once you start, you'll keep turning pages until you're done. This is amazing story and Mr. Freedman is a terrific writer. As in Leviathan, the war begins in June 1914 with the assassination of Arch Duke Franz Ferdinand of Austria-Hungary. The great powers of Europe think they have foolproof plans to conquer their enemies and that the war will be over by Christmas. They are not prepared for what happens, however. Technology has progressed and weapons have become more deadly and the Allies and the Central Powers become locked in a long and deadly struggle. This book tells all about those struggles. You'll read about the Battles of Verdun, the Somme, and the battles at sea. There are tales of incredible endurance and heroism, arrogance and stupidity, and unexpected friendliness at Christmas. As I said, Russell Freedman is a very talented writer and he makes the events move right along. He doesn't give just a bunch of dry and dusty facts; he makes the story and the time come alive. He also quotes letters from the soldiers who were actually there, adding more depth and feeling to the story and making us remember that this is not just a story but real events that happened to real people. And I have to let you know that some of the events were terrible. War is an ugly business and some of the sights the soldiers describe are horrific. Keep that in mind when you check this out, guys. Or parents--you might want to check this out for older guys. But if you do, you'll find a book that you won't want to put down until you've read the very last page. I know that was true for me! And you'll find that this book is not thick, slow or boring. You could easily read it in one afternoon, just as I did. So check this out and learn a fascinating story about a time that a lot of people don't remember anymore. 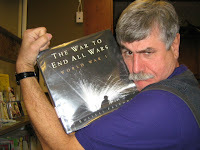 The War to End All Wars receives the Iron Guy Seal as One Terrific Book! More and More Voices in the Great Greg Heffley Debate! Diary of a Wimpy Kid is much better than Milo or whatever! Thanks Super Simran, but we need a little more. We want to know WHY Diary of a Wimpy Kid is better. Write us back and tell us, OK? We'd love to know!! Greg Rules. Yea thats the ticket!!!! Gimme Prize, Gimme Prize!!! This is not by the way, Library Ninja Bill, not at all. Don't even know the guy. Thanks, Karate Guy...WAIT A MINUTE!! This sounds suspiciously like my good friend Ninja Librarian Bill over at the Boys Rock, Boys Read! blog. Trying to sneak up on me to get a prize, huh?? Well, it won't work. The Iron Guy exercises his brain as well as his iron muscles and I see through your disguise. Nice try!!! I have never heard of the Brixton Brothers but, it sounds pretty good to me. I said I liked Diary of a Wimpy Kid but, I like Maniac Magee better. the 3 part thriller winning the newberry medal. It's like no other book I've read (Which is a lot.) so I'm on both sides of this. Don't count me in the contest, but I have to agree with you that Greg is annoying. I want to slap him. I can't find him funny, because if he were a real kid he would be causing so many of his own problems. Milo was okay, but the one I really like is Big Nate. he means well and is so exuberant, but things just don't work out for him. Well, all of the grownups seem to agree with me that Greg Heffley's a jerk (see my original post about him here) while kids seem to take the opposite tack. So am I wrong? Am I right? Tell us and you could win the prize in the Great Greg Heffley Debate Giveaway! I'm writing in from Orlando.I like the diary of a wimpy kid books because you never know what is going to happen next.Like when they go camping it just starts to rain.And that's why I like diary of a wimpy kid. And here's something else to get excited about--the arrival of the newest Brixton Brothers book. I'm a big fan and am looking forward to reading this one. (It's called It Happened on a Train and it's by Mac Barnett) Steve Brixton thinks he's retired from detective work but looks like the mysteries won't leave him alone. This books are great fun and, judging from the cover, this one should just as entertaining. Have a great weekend and send those comments in! We're Honored to Receive the Liebster Blog Award! 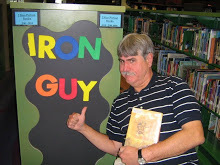 Ms. Yingling Reads--a truly terrific blog that also focuses on guy reading! Chocolate Air--it says that "Reading is like breathing chocolate air!" How can you not like a blog with such a logo? And here's yet one more site. I can't nominate it because the Iron Guy and a friend work on it in their spare time (it wouldn't be right to nominate myself for this award) but it's a rocking site that every reader guy in the universe should know about--Boys Rock, Boys Read! Thanks once again, Readingjunky, and be sure to check out these sites, guys! My friend and I also talked holding a debate and giveaway on our respective blogs. So that's what I'm going to do! As of this moment, the Iron Guy is throwing down the gauntlet to all you reader guys, especially those in the Charlotte and Mecklenburg county area. I want to hear why you think the Diary of a Wimpy Kid books are great. Or why you don't. Or why you think Milo is better. And to make this debate sweet, I'm going to give the guy who writes the most convincing argument a chance to pick a prize out of our ultra-cool prize box!! There are books, t-shirts, and other cool things in there. And I'll give you three weeks to do it! So, come on, all you DofaWK fans. Tell us why those books are so great and make us believe it. Don't just say, "They're funny and I like them"--tell us why they're so funny. There are lots of funny books out there--what makes these better? Or why don't you like them? Or why is Milo better? The prize goes to the guy who, as I said, writes the most convincing argument on either side. All right, guys, get those thinking caps on and those keyboards fired up and join in The Great Greg Heffley Debate! !